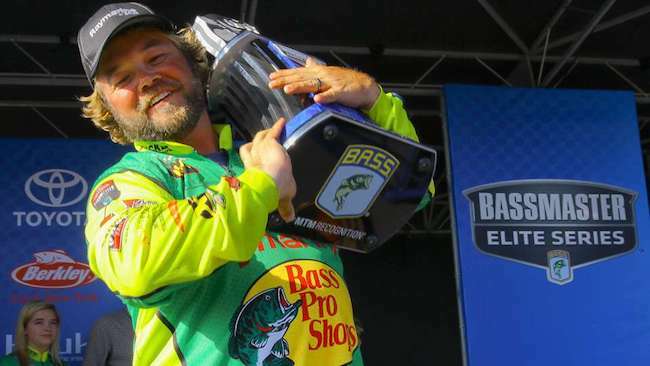 By now you’ve probably heard about Tim Horton held on for his first win in a decade at the Elite Series event on Okeechobee over the weekend. But did you realize there were seven other Regional and Minor-level tournaments being held the same weekend? That means nearly 1,900 anglers competed in professional tournaments this weekend, and that doesn’t even begin to count all the local events. Basically, on any given weekend there are A LOT of anglers putting their money on the line trying to catch the best five-bass limit. Pretty cool, huh? Well, with all respect to Todd Castledine (FLW Costa Series winner on Sam Rayburn) and the six other Regional winners, let’s take a look at Horton’s victory and what the event has done to the Majors Ranking. In the early 2000s Horton was clearly on top of his game. From 2001-2009 he had 28 top 10s between Major and Minor events, with three wins. But from 2009 until this previous weekend, Horton had notched just six, and he hadn’t tasted victory since 2007. Four days of good fishing can heal all, and Horton certainly was ecstatic to end this drought, especially after an awful start to his season on Cherokee. As for his ranking, the Muscle Shoals, Ala., pro was scraping to stay in the top 100, but now he’s jumped up to 84th. Meanwhile, Ott Defoe keeps doing what he does best, quietly racking up impressive finishes. He nearly came from behind to win at Okeechobee, and he now is up to No. 6 in our ranking. Another one who has quietly climbed into the top 10 is Bobby Lane. Lane has actually finished in the top 30 in eight of his last nine Elite Series events. On the flip side, Jacob Wheeler’s streak of top 50s finally came to an end. He hadn’t finished outside the top 50 since August, 2015 until his 61st at Okeechobee. He slipped from eighth to 10th as a result. Alton Jones took a slip to 11th after this weekend, but more noteworthy is Aaron Martens’ recent slide. We can’t say he’s struggling, as he’s still ranked ninth, but his past 12-month average (641.261) is way down from his 24-month average (714.268). That includes all tournaments, but in our one-year Majors Ranking, Martens has fallen to 35th. Again, still very good, but not up to his usual standards.